As I've posted, I'm a avid reader. Always have been. Always will be. As a result, a lot of people ask what I'm currently reading and what my opinion of random books are. So, I'm adding a new section of the blog for books and will make an attempt to review one book a month. Interestingly, while I love to read and talk about books, I'm not much of an actual reviewer. I'm not one to go into the details of the subtle subtexts of books. I'm more of a "yes, I liked this book and you should read it" kind of girl. Now that I think about it, it's kind of like my race reports. While I won't be able to tell you my average watts on the bike leg at the Mach Tenn tri were, I can tell you the race is awesome and you should do it. So, here is my review: It was good. You should read it. Expecting a bit more? OK. Here goes. 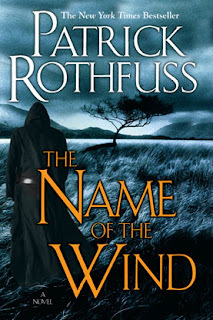 "The Name of the Wind" is the first part of a trilogy (The Kingkiller Chronicles) based on the autobiography of Kvothe, a legendary magician, traveler and musician living in a world called The Four Corners of Civilization. For reasons unknown, he is now in hiding and living the quiet life as an innkeeper. An unexpected meeting with a famed scribe called "The Chronicler" leads to Kvothe telling his life story over a period of three days. "The Name of the Wind" is the story from the first day, and covers Kvothe's life from his early nomadic childhood (his parents were basically carnies) through his first few semesters at University (age 15-16). I don't like spoilers when reading reviews, so I'm not going to go into any detail about the plot. I will say that this book has been compared to the Harry Potter series. I can kind of see that because both of the main characters are young, magical and going to school. But that's pretty much where the comparison ends. "The Name of the Wind" has a darker feel (at least when compared to the earlier Harry Potter books), and Kvothe is definitely more of a loner. Sure, he has friends, but there are no Ron and Herminone rushing to help him out of his many obstacles. Kvothe has to fend for himself. And he does. In some ways, too well for a character of his age. That's probably one of the main issues I have with the book. I kept feeling the character should be in his late teens to early 20's for most of the story. The book is written in a non-linear style, jumping back and forth in time between Kvothe's childhood and present day. Frequently, this type of book really annoys me. I like books that are in chronological order, however, Rothfuss spaced the time-jumping out enough to not be distracting. I also didn't have that hard of a time with the otherworldly language that is generally found in fantasy novels (I'm looking at you, "Wicked"). Sure, there were a few times when I had no clue what the characters were talking about, and I wish some of the magical spells were explained in a bit more detail, but overall, I was able to enter The Four Corners of Civilization pretty effortlessly. This is definitely a Level One book as far as fantasy books go. Perfect for people like me who generally shy away from this genre. 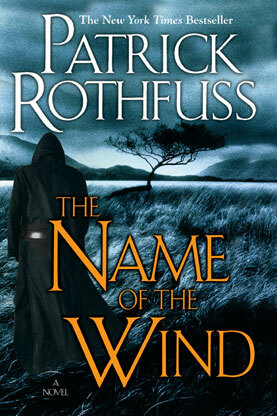 For a book of almost 700 pages, "The Name of the Wind" moved pretty quickly. The first few chapters dragged a little bit, but once The Chronicler is introduced, the book picks up. I finished it within a week. Granted, I was on vacation and had a lot of time to read, but it would have kept my interest even without the extra reading time. I'm probably going to start the second book in the series "The Wise Man's Fear" next week. Truthfully, this is more so because I'm afraid I'll forget the characters if I don't read the sequel right away, rather than an overwhelming desire to continue the series. I didn't put this book down, run back to the library and get the next book immediately as I have with other book series. However, given my history of bias against fantasy novels, the fact that I'm actually planning on reading the next book should be some sort of sign as to how good the book is. When it comes down to it, it's a well-crafted story, and that's all I really want out of a book regardless of genre. For that reason, I'm recommending it. I have a few books in the works for next month, but if anyone has any recommendations, please let me know! I'm always looking for good books! The first week of the Tour was rough on the wearer of the Yellow Jersey. Two riders wearing yellow crashed out of the race. Poor Fabian. Poor Tony. I'm not sure who I felt worse for. I was crushed for both of them. When Paul Sherwen compared Chris Froome's dominance of Stage 10 to Lance Armstrong. I would have loved to have seen the side-eye from Phil after this comment. Apparently, they need to eat more "tainted beef." Looking good. Hope he hangs on for the podium. Badass. Is there ANYTHNG he can't do on a bike? Don't mind me... I'm just gonna pop a wheelie across the line. 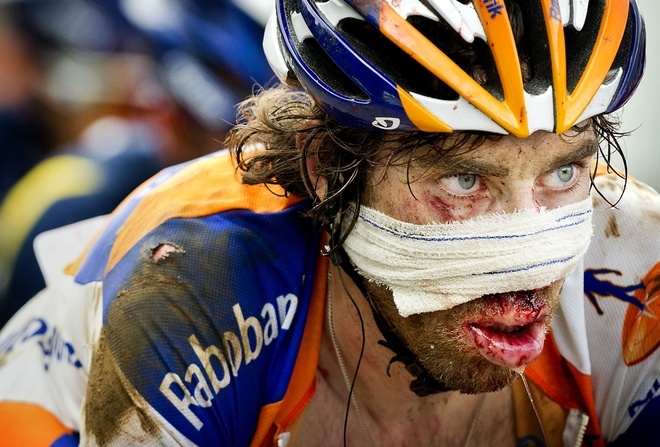 As usual, he's one of the toughest men in the peloton. Wrecks HARD, dislocates his shoulder, pops it back in and continues to finish the stage. Not as dramatic as crashing on his face a few years ago, but still impressive. How painful does that look? Still has the best faces in the Tour. When Eritrean Daniel Teklehaimanot won the King of the Mountains jersey. If you don't know who I'm taking about, look up his story. - Oh my God - if I see that Hannah and her Horse commercial one more time, I'm going to lose my mind. Seriously. They're just terrible. - The Volkswagen ads with the three older ladies who are hitting on the younger guys... What's up with these? I'm not sure how these ads are supposed to inspire anyone to buy a car. - I don't drink Heineken, or beer actually, but Neil Patrick Harris can do no wrong. Looking forward to the second half!! 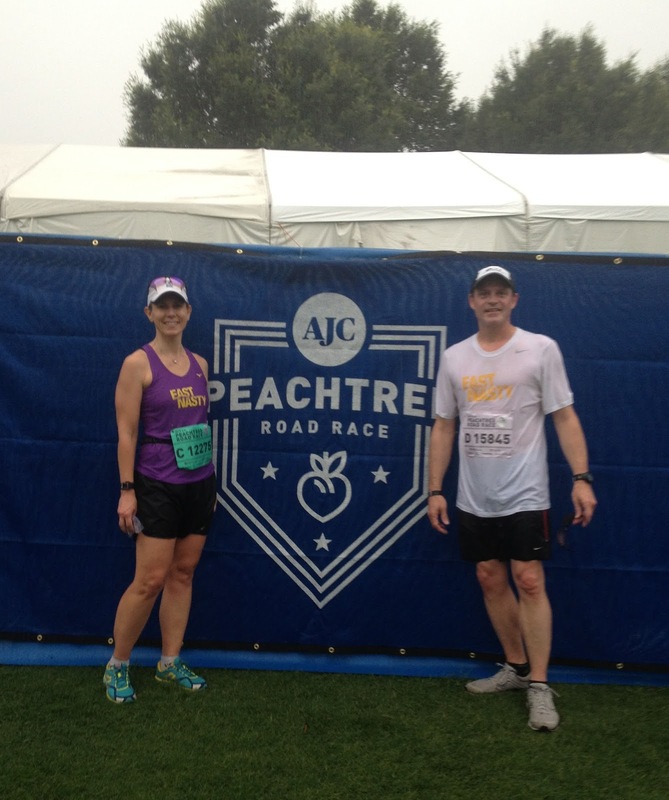 The weekend started Friday morning when Dudley and I headed down to Atlanta for the Peachtree Road Race (PRR). Unfortunately, the trip took a bit longer than expected because it was the Fourth of July weekend and I think everyone in the Southeast was also heading to Atlanta - traffic was terrible. And so was the weather. Nothing is more fun than traveling over Monteagle in a blinding rainstorm with tractor-trailers speeding around you. Fortunately, we made to Atlanta a little late, but safely. We decided to go directly to the expo because traffic was a insane and we wanted to make sure we got there before it closed. The expo was held in the Georgia World Congress Center, which I guess is their Convention Center. It's a huge complex next to the Georgia Dome and very near to Olympic Park, The Georgia Aquarium and the World of Coca-Cola. 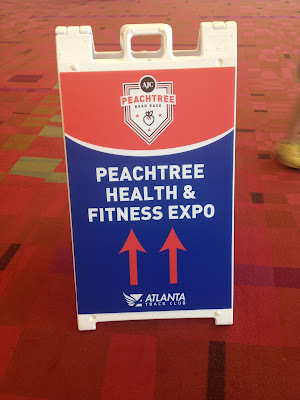 All of this is great if you're a tourist and have the entire day to spend in downtown Atlanta, but it's a logistical nightmare if you just want to pop in and out of the expo. Sure, we could have gone to the hotel and taken the MARTA (subway) down there, but we were naive and didn't know how bad traffic and parking would be. And it's BAD. Furture Peachtree runners, learn from our mistake - take the MARTA down to the expo. However, once you got into the expo, it was pretty cool. I mean, it's the "World's Largest 10k." It should be cool. It had the same stuff as most expos and a ton of PRR Swag, but you generally don't see an expo this big for a 10k. It was well-laid out and never got too congested. Packet pickup was really easy too, and I expected a cluster with so many participants. 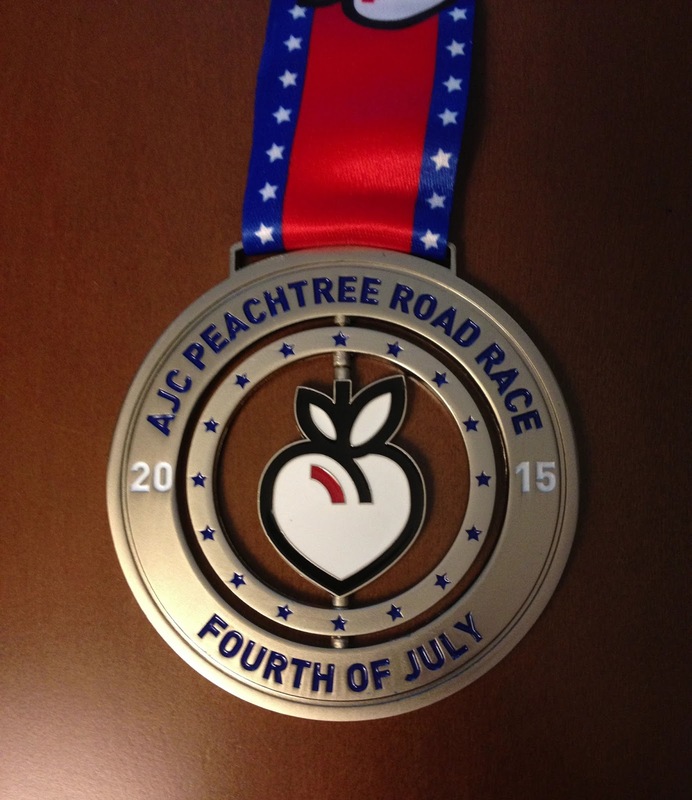 Well done, Peachtree! One of the many shirts I didn't buy. The route. Probably should have really looked at this before the race. 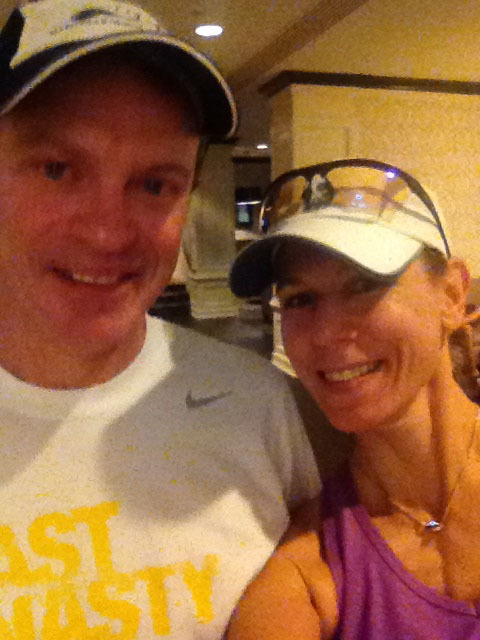 After the expo, we headed to the hotel which was located near the race start in Buckhead. Generally, I'm really detailed about the logistics for out-of-town races, but I've been so busy that I really haven't had time to do anything other than book the hotel. For me being totally clueless about Atlanta, we really lucked out. I was really happy with our hotel (Doubltetree). It was really convenient, especially for the Fourth of July. 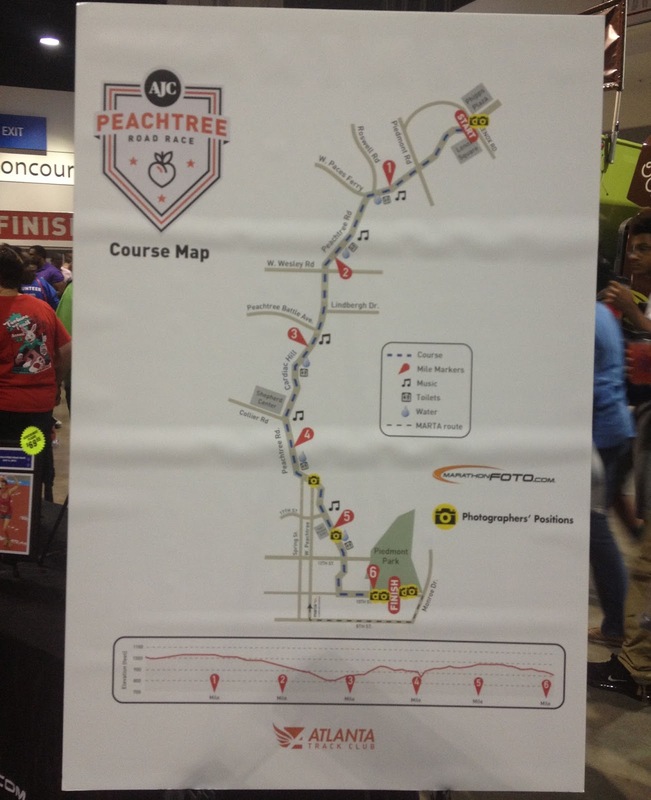 It was right at the race start and about two blocks from MARTA station. I recommend staying there if you go down for the race. I was in Corral C. I saw people with Corral X. That's insane. As mentioned, I didn't do a lot of planning for the race. Not only was I crazy busy, but it's also just a 10k. Yes, that can be far if you're not running a lot, but both Dudley and I are in the middle of marathon training, so six miles is a short run for us. Nothing to really stress about. And I have to say - it's FUN to not stress about a race. Triathlons have SO MUCH STUFF and I have about 10 lists of everything I need. It was fun to just throw on my running shoes, walk out the door and be ready to go. And that's exactly what we did. Our plan was to get to the corrals about an hour before the 7:30 am start, so we could soak up all of the PRR atmosphere. Unfortunately, it was raining when we started to head out, so we stayed in the hotel for a bit until it passed. Being that we were so close, we still made it to the start with plenty of time to spare, even with the delay. Me, D and a GIANT flag. GO USA! The elites went off right on time. I was a little concerned about how long it was going to take for us to reach the starting line because there were so many people. Even with us being in one of the earlier corrals, there were still a ton of people in front of us. However, this isn't PRR's first rodeo. They were ON it. I think they let a corral go every two minutes. They were very efficient and we were running within 10 minutes of the starting gun. I was a little claustrophobic for the first mile or so. Big races are always congested during this period, but this seemed worse. It was also really steamy, as the rain had stopped and we were wrapped in a blanket of humidity. Dudley seemed OK with everything, but there was about a five minute period where I was about to lose my mind. It passed before I had a total freakout though, which was nice. Because that wouldn't have been embarrassing AT ALL. I should have really looked at the elevation map I took a photo of at the expo, because I was surprised at how hilly the course was. I knew about Cardiac Hill (never a good thing when there is something called Cardiac Hill on the course), but I thought the race flattened out after that. It didn't. I had been nursing a minor calf injury for the past week, but, thankfully, the hills didn't anger it too much. I tried to really look around, have fun, and take in the race. Probably 30% of the people there were decked out in Red, White and Blue. There was a guy running in a patriotic, blow-up sumo thing. I have no idea how he was running in that. I also saw three guys dressed as Founding Fathers, complete with the white, powdered wigs. Way to commit to the theme, guys! And I went a little out of my way to run under the Holy Water provided by a local Catholic Church and was blessed by their priest, who was cheering along side the race course. Every little bit helps, right? The rain returned around mile two and didn't let up until the after our race was over. It was pretty bad for a bit. Apparently, the race organizers delayed the start of the later corrals due to lightning. Though I heard thunder, I didn't see any lightning, which was good because we had no place to go for shelter. The big bummer about the rain was that we didn't get to hang out and enjoy the post-race festivities. We pretty much got a bit of food and our finishers shirt and left. 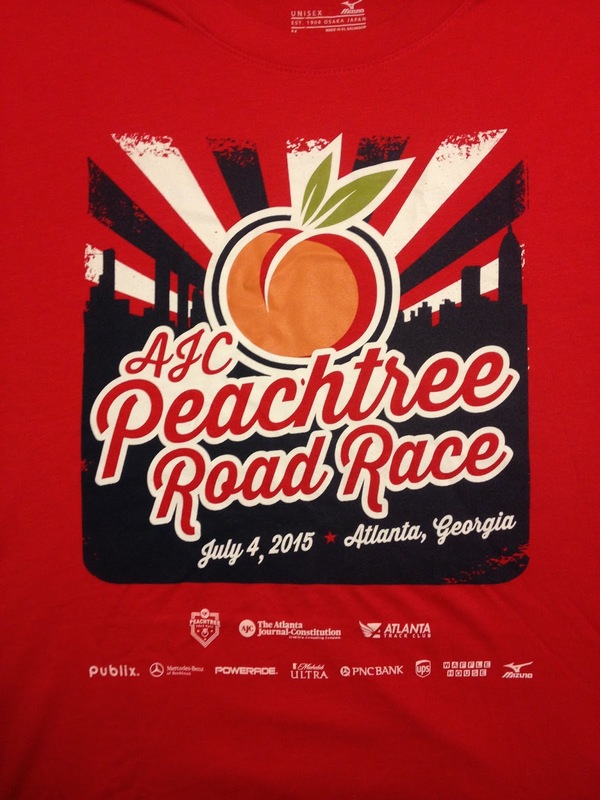 Speaking of the finishers shirt...this is a big thing for the PRR. It's the only shirt you get with your entry, so if you don't finish, no shirt for you. For people who have been doing the race for 40 years, these things are a true badge of honor. Considering the shirts are SUCH a big deal, you would think that they would want as many people as possible to wear them. Apparently not, because they only had unisex shirts and they ran WAY too big. Seriously. I have a men's small and it can only be used as a sleep shirt because it just swamps me. 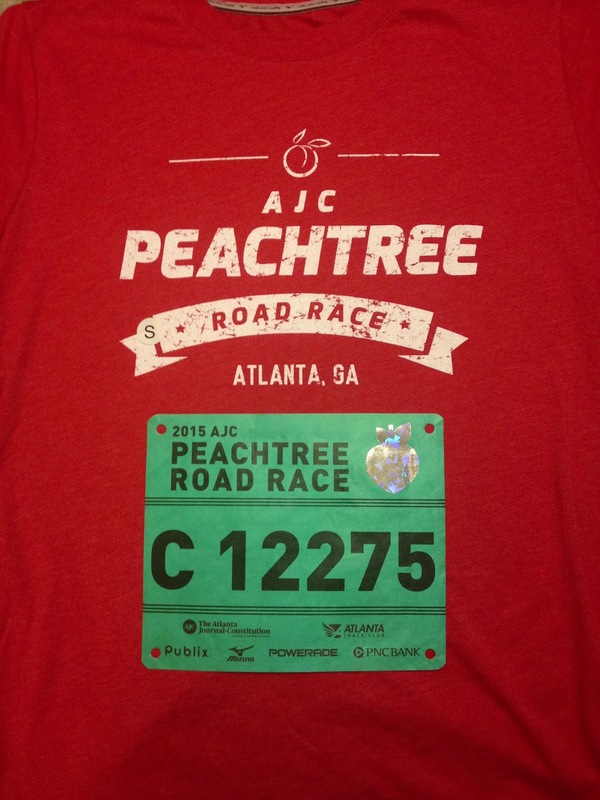 PRR won't let you exchange the shirts at the race either. 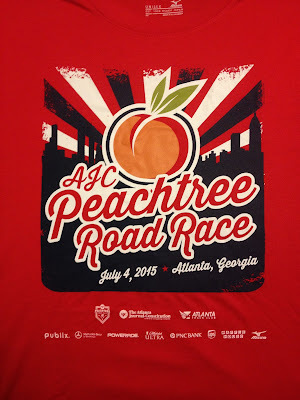 (They do have an exchange in ATL the week after the race, but that doesn't do out-of-towners any good.) PRR was so on point for everything else, I was surprised and kind of bummed about the shirt. The shirt I will never wear. Medals are not part of the package for the race, but you could buy one if you wanted. I figured since this was a bucket list race for us, I'd pony up the $20 and buy medals for the two of us. I'm glad I did. Even with the shirt situation, I'd absolutely do this race again. There were only two other things that irked me about this race, which had nothing to do with the PRR itself: 1) the girl who ran with the selfie stick. NO! Stop it! You're running with 60,000 other people! It's dangerous. Put the stupid selfie stick DOWN! 2) the kid at one of the water stations who decided that pelting runners with fruit would be a good idea. I'm not sure if he was mad that no one was taking his orange slices or what, but I really didn't appreciate being hit with a piece of citrus. Other that those little things, the race was pretty much perfect. Running with 60,000 other people wasn't bad because we were so staggered around the course. The water stations and food areas were fully stocked, at least when we were there. The food vendors at the end of the race were almost begging us to take more food with us. That never happens! The race organizers even had dry towels for us at the finish. Granted, they were probably originally intended to be for sweat, but they work after a storm, too. It was really nice to have something to dry off with after running in the rain for four miles. Is this not hysterical? So many people!! The overall (non-elite) male won in something like 29:00 and the overall female (non-elite) was 32:00. Crazy fast. This race should also serve as a warning to those speedy runners who win races. The man who was winning the non-elite race thought he had it in the bag, and he slowed down to cross the finish line...only to be passed. He lost by 9/100s of a second. Check out the video. It's heartbreaking. If you have the chance, you should do this race. 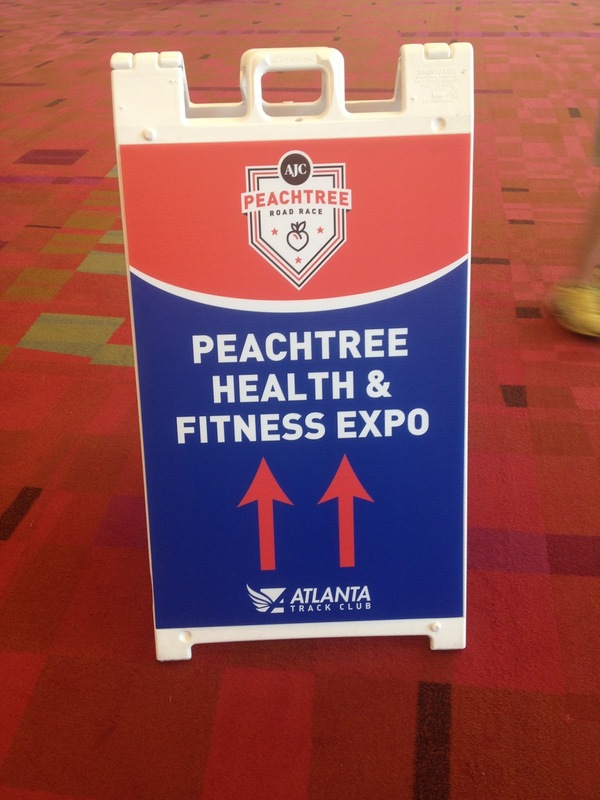 It was extremely well-organized and additionally, everyone in Atlanta was just so nice. I think Dudley and I had to have said that about 10 times throughout the weekend. "Everyone is SO nice!" It kind of became a running joke between us, but they were. The volunteers, the other participants, random strangers we asked for directions - everyone. 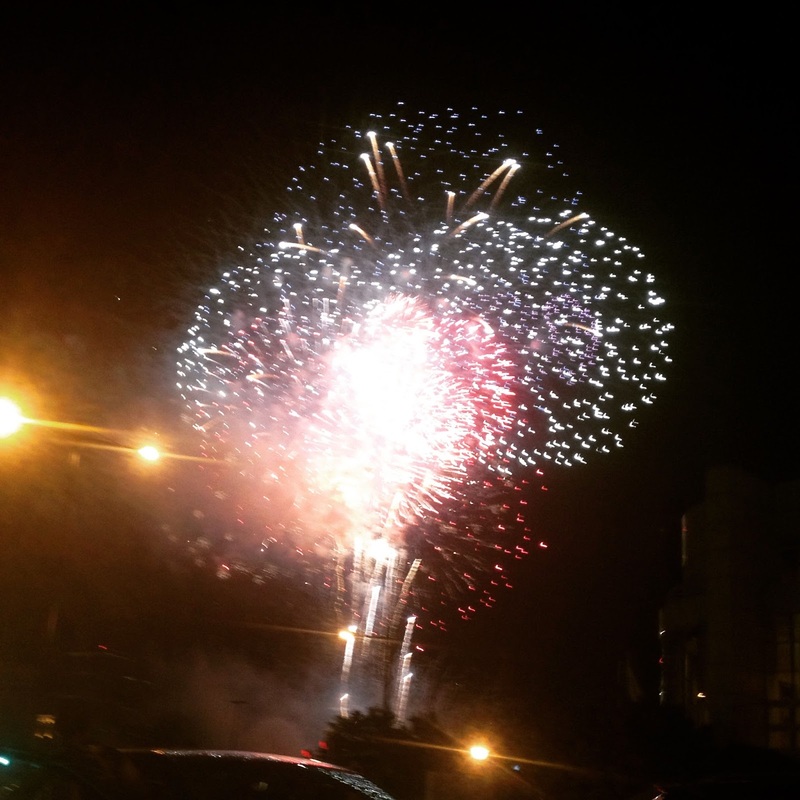 And as a bonus - Buckhead has one of the best Fourth of July Fireworks celebrations in Atlanta (who knew?). We just had to walk out of our hotel and BAM - fireworks. If you're interested in the PRR, remember - it's a lottery, so plan ahead for when it opens in 2016. It's an easy drive from Nashville and a fun weekend away. I don't know if we'll be back next year, but I'd love to do this race again in dryer conditions. Thanks PRR and Atlanta for a great race! 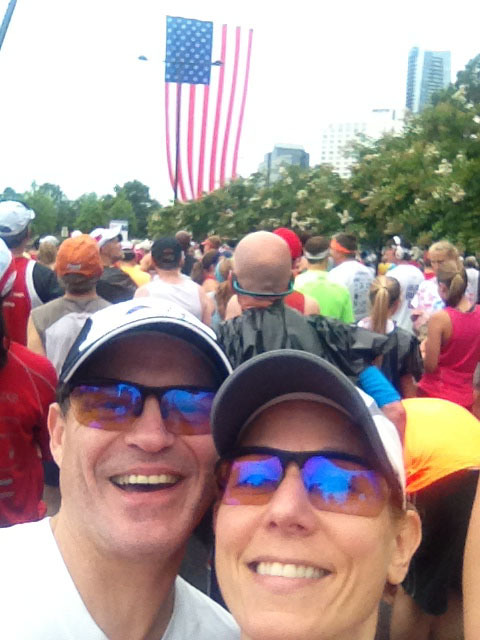 Dudley and I are doing something different this Fourth of July - the Peachtree Road Race. This race has been on my bucket list for a few years. Why? Because it's the World's Largest 10k. That's right - the World's Largest. As in 60,000 people large. SIXTY-THOUSAND PEOPLE! Running. At one time! Holy crap. 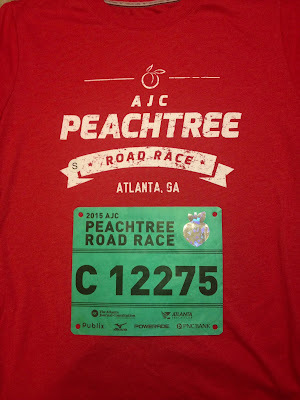 As someone who doesn't like crowded races, or crowds in general, this race could be my personal version of hell. However, there has to be a reason why this race has been around since 1970. And also a reason why 60,000 people want to do this race every year. Correction - 60,000 people GET IN to this race. There's a lottery to enter. I already know we're not going to be posting any PRs at this weekend - just too many people. Even my coach said to take a camera and have fun, which is exactly what I'm going to do. I'll let you know how it goes!